Successfully Added BetterLife iSlim TC 80W Box Mod Kit - 0.1 To 1-Ohm Resistance, 80 Watt, 18650 Battery, Temperature Control (Black) to your Shopping Cart. The iSlim 80W box mod from BetterLife is a high-end and extremely powerful box mod that allows all the experienced vapers among us to upgrade their current vaporizer and experience an extraordinary powerful yet smooth vape during their upcoming vaping sessions. 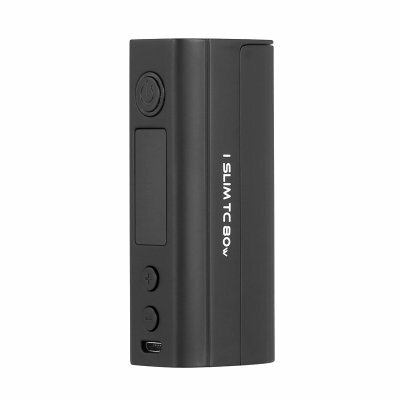 Thanks to its adjustable Wattage that ranges from 5 Watt all the way up to 80 Watt, the iSlim box mod can alternatively also be used by beginning vapers that steadily like to upgrade their vaping style without needing to switch their beloved box mod. Whether you’re an advanced vaper that is searching for a more powerful vape, or just entering the vaping world on your quest to replace those harmful tobacco products – the iSlim 80W box mod is sure to deliver a top-end experience to everybody out there. Featuring a powerful 18650 battery (not included) this box mod packs plenty of power to get you trough numerous of vapes without needing to recharge your device. Simply attach this powerful box mod to your favorite tank atomizer, fill it up with the taste of your liking, and you’ll be all set to enjoy multiple of relaxing vapes all throughout the day. Thanks to its 510 thread, the BetterLife iSlim 80W box mod is compatible with the majority of tank atomizers out there, providing you with a wide range of upgrade and customization possibilities to built the vaporizer that is capable of satisfying your exact personal vaping needs. Besides its adjustable Wattage, this box mod furthermore features a manual temperature control feature that lets you optimize your personal vape experience even further. Added to that comes the 0.1 to 1-Ohm resistance range that allows you to personally choose the amount of taste and vapor created during every vape – assuring that you’ll be able to enjoy all this powerful vape mod has to offer customized to your personal needs. Not only does the iSlim 80W box mod provide you with a highly tasteful experience, it also is capable of producing exceptionally large vapor clouds. Crafted out of durable stainless steel, this vape mod features a tough and stylish design that is pleasant to look at and comfortable to hold. Thanks to its easy to use design and adjustable settings, the iSlim 80W box mod is the perfect vape mod for every vaper out there – no matter their vaping style or experience. The iSlim 80W box mod from BetterLife comes with a 12 months warranty, brought to you by the leader in electronic devices as well as wholesale electronic gadgets..